One of the most exciting parts of taking on a hobby like woodworking is buying all the stuff that goes along with it. I know I’m always looking at the next tool to buy for my shop. But what if you are just starting out and have a few things (or maybe nothing), and need to figure out where to go? If you’re like me you don’t have unlimited funds to go buy everything related to woodworking. You want to get the best bang for your buck. And when you get the stuff you need you should be able to make a ton of projects. A beginner most likely doesn’t need an industrial planer or a fancy domino joiner. A beginner needs just what is necessary. If this sounds like you, then this list should help you get situated. I have included the main tools. There are always smaller tools that you can add, but I haven’t gone into too much detail on those. You can buy those tools as you need them. The big purchases are the ones that need to be thought out and planned on. For example, a miter saw will be a cornerstone of your workshop. It is important to plan on having this tool and to choose the correct one. A miter saw will allow you to precisely cut pieces of wood for almost all of your projects that you will undertake. Besides the drill, I cannot think of a more important piece of equipment. There are of course several ways to cut a board, such as a circular saw or radial arm saw. The miter saw is to me the most efficient, easiest, and safest way to accomplish this task. Another important job that a miter saw does is to cut actual miters. You can angle the blade to cut the board without much trouble. This is a tool that will occupy a permanent space in your shop. Go HERE to find the best miter saw with my buyer’s guide. The cordless drill is ubiquitous. You may already have one. If you do then great, otherwise you will definitely want to seek one out now. In my humble opinion, you really need two. 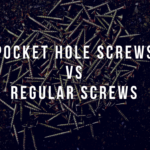 There are many times when you are switching back and forth between drilling something and driving a screw. With only one drill this requires you to switch the bits every time. Two drills can alleviate this issue and dramatically increase your productivity. This can wait, however, because that may be cost prohibitive. I will leave it up to you. 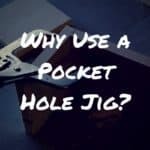 If you plan on using Kreg tools and constructing projects using pocket holes (I highly recommend this), then you will without a doubt need a drill. Drills vary in range from under $100 to over $200. I recommend a cheaper one at this point because the quality does not suffer very much. I am amazed at the price point some of the brands can get to and still have a drill that does everything I want it to. Just make sure it has a lithium ion battery. 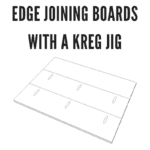 Kreg Tools is a brand that makes jigs, clamps, and other woodworking tools. 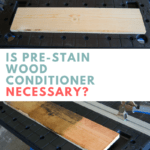 These products have allowed many beginner woodworkers to build things that were previously not possible. I love using them. The main tool that you will need to get is a pocket hole jig. There are a few different styles, but they all use the same concept. Drill holes in the end of a board at an angle, and then screw it to another board. It sounds simple but the things you can do with that joint are almost unlimited. I have a page on all the Kreg Tools that you can get, and also a post on the Best Pocket Hole Jig. They can get expensive if you get a high end one (which you would not regret), but the basic jigs are also affordable. 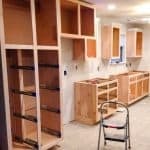 Sanding a woodworking project is almost always a necessity after it is built. This can obviously be done by hand with a sheet of sandpaper and a block, but most of the time a powered sander is much more efficient. The random orbital sander makes quick work of this task. It is great because it is easy to maneuver around all the edges and corners. They are relatively cheap so pick one up and some sanding pads (150 and 220 grit minimum) as well. A circular saw is a versatile tool. It is portable and simple to use. If you do not have a table saw or a track saw, then you will need a circular saw to cut down large sheets of plywood. This is completely normal, and there are many jigs out there that will help you cut in a straight line. I like to keep a circular saw handy because sometimes it is too much trouble to get set up with the table saw. Also, there are times when only a circular saw can fit into a space, or maybe you need to cut something after a piece is already begin built. There are many choices for which one to buy, and they generally don’t cost a whole lot. A table saw is a staple in an established wood shop. The reason it is last in this list is I think you should get the other tools before you invest in a table saw. This is for a couple of reasons. 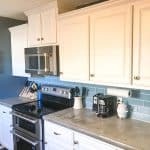 One is that you can do a lot of projects by ripping sheets down with just a circular saw. Kreg even makes a jig for the circular saw so that you can do straight rip cuts. The second reason is that it usually costs a lot of money to buy one. 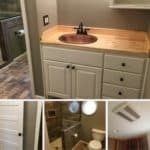 You want to make sure that woodworking is something that you are really going to do before you invest that much money. But if you plan on continuing with the hobby, then by all means get yourself a table saw. There are simply some techniques that only a table saw can really do. There is a caveat to the table saw recommendation. You could get a track saw instead and set it up to function similar to a table saw. A track saw is basically a circular saw that is fitted onto a track. This track is then clamped down onto the material, usually a sheet of plywood. It makes quick an easy work of breaking down 4×8 sheets, and it can do rip cuts as well. I usually rip a lot of 2x4s for my projects, however, and I am not real sure if it can do what a table saw does in that regard. 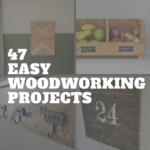 If you have made your way through this list and are excited about continuing, check out my beginner woodworking projects roundup list. This will get you on your way to making some cool things. 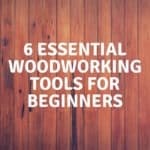 As a hobbyist your journey into woodworking will only get more and more advanced. This will obviously require buying more tools and other cool stuff. 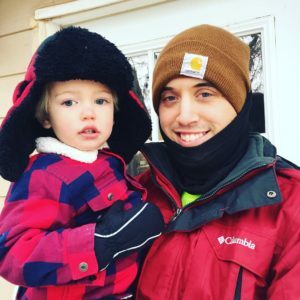 So what should you do after getting the basics? Your specific shop needs will vary based on what kind of stuff you are making. It might be that what you have is doing the job well for now anyway. In that case then I would say keep on doing what you’re doing. Maybe start your own blog about your projects. 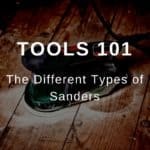 If you are excited about gathering up a more comprehensive tool set, then there is a whole new tier of woodworking tools that will for sure deplete your bank account. It can be worth it though! I have been looking for a site like yours. I am glad I saw it on Pinterest. I have made a few things from Pinterest. I am very interested in what you will be sending me. I can’t wait. Once I get my garage all straightened up from moving I plan setting up my new used Craftsman table saw. The 1st thing I want to do is make a slide for the table saw. This is a big upgrade for me. I had a smaller tool shop table saw. It was ok but it was hard to keep the fence square. I will be looking forward to some of the DIY diagrams. I also make the cable reel benches. People love them. I have made 3 last summer. I have 5 more reels to make 5 more benches. So I am looking forward to the DIY projects you send.